Thanks for the feedback Bronxie. Oh these fellows are hard to shoot! Well done! They are thanks for the note. Look around you and you will discover a whole new world! Nature is fascinating. This image shows a dragonfly holding tight to the edge of a plant, amazing to see such small legs holding the whole body up. This photo also allows us to contemplate such a beautiful creature and see details that otherwise we would not pay attention. I took this image while in a farmstay in Australia. My kids went off to explore the farm and I jumped to the opportunity to photograph these little creatures that were almost invisible to the eyes. However, once I got close to them I discovered a world that without my camera would have gone unnoticed. I spent hours watching their behaviour, so capturing this image was far from easy, as they do not stay still for too long. When they fly they are quick. So, this little guy seemed to have understood what I was doing and after several attempts trying to capture it, this dragonfly decided to stop at the edge of this plant and balance itself so I could get this majestic and impressive position. It was quite early in the morning. While in the farm, we got up and had breakfast early. The kids could no longer wait to get out and about. So, we left and while they were playing in the mud and swimming in the lake. 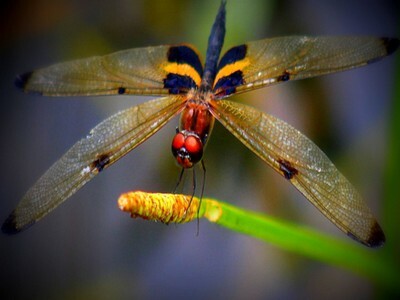 I was watching the dragonflies and other creatures. So, I would say this was about 7 am. They were very active at that time of the day, flying everywhere and showing off their skills like this one in the picture. Natural light. It was all done with nature resources. It was a summer morning and the conditions were perfect to shoot. This image was captured with a Canon EOS 1200D, flash did not fire, no use of tripod, lens EF75 - 300mm, aperture f/5.7, focal length 180.00mm. The inspiration simply occurred as I was walking by the lake on my way to the farm animals when I spotted the dragonflies. When I went to the farm, I knew that there would be farm animals, but never expected to see beautiful dragonflies from all sort of colours. The way they moved and stopped at plants and rocks near the water were my inspiration. Before starting shooting, I did study their movements and behaviours, however unpredictable it was possible to capture this image. Yes, however very little. I sharpened this image and saturated it a little to bring up the colours on the subject. My camera bag always has my canon 1200D fully charged, my two favourite lenses canon 18 - 55 mm and canon 75 - 300 mm, and if I know I am going to shoot macro I carry my digital advance HD high definition DSLR Pro MC AF digital wide converter w/Macro 0.48x 58mm and a fully charged canon 1000D. Patience is the key to capture busy small subjects like this dragonfly in the image. Great weather conditions are always good. Also, be sensible as these little guys do love water and is very difficult to capture them, however it is not worth putting yourself in an unsafe position where you can fall in the water with your equipment.